I am punctual, professional, and skilled, competitively. *PAINTING & PLASTERING: I have team of professional painters. My team complete jobs very quickly. I messaged Michael one morning - he was around that afternoon to quote, and then back the next day to complete the jobs! Couldn't believe how efficient he was....and he was so good that I ended up adding a whole lot more jobs to his list.....was amazing to get so many jobs completed that had been sitting around for a long time. Highly recommend, and I will absolutely use again. Thanks Michael! Fantastic to work with. Very prompt service and friendly. Highly recommend. Would definitely use again. Michael is very prompt at replying to enquiries! I filled out the form on his website and he called back within minutes, scheduling my job (furniture disassembly, assembly, and garden weeding) for the next day. Efficient, tidy, and also likes a bit of banter. Call him straightaway if you need a job done quickly and without fuss. Thanks, Michael! Great guy who is prompt and does a wonderful job ?? Michael does what he says he will do. And does it well. I have sought help from Michael more than once, and will gladly call on him again. Fabulous job. Michael was great to work worth. Very efficient, tidy and prompt. Michael, of H & G is a remarkable trade person. He is prompt with all the communication and very responsible with business dealings. He is straight-forward and honest. Customer satisfaction is his top most priority. Overall he knows his work thoroughly. Without any hesitation I will recommend him for future business. Amazing service! Called me back within 20 minutes, had a quote within 45 and the job was complete within 2 hours and this was on a Friday afternoon might I add. So happy with the finished result and the professionalism with which he employed! Thanks again! Amazing! Michael was so quick and efficient. We needed a gardening job done in a certain deadline. Michael must have started the very same day. Really knowledgeable about plants. He gave us some excellent advice. We will definitely be using him again in the not too distant future. Reliable and get the job done within a week after contact. Recommended to everyone! Michael turned up the same day that I called him and started work two days later. He is the most efficient tradesperson that I know. He gave great advice. It seems like he can do everything - cut trees, grind stumps, put up a new fence, repair broken stairs etc. All the work was done very promptly and satisfactorily. Thank you, Michael. 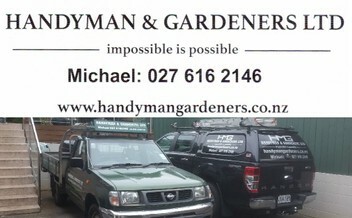 Michael and his team are punctual and professional . I am so happy with my garden area and thankful for his advise also about my roof . They worked hard in the rain and I will be using them again !!! He even saved my caterpillars from the swan plant and regimes them !!! Amazing job team !!! Thank you for sorting out the deck gate and clothesline. From the onset, you have discussed how the work will proceed and what is needed so that I can decide whether I can afford your service and the expenses involved. From there, the work was completed. I appreciate every technical advice received. God bless you more strength to be of service to more people. Michael has been a brilliant asset to us. He is one the rare tradesman that can do anything from changing a tap washer to conducting a full scale renovation, as well as looking after all our gardening needs. He is very responsive too and you can always rely on Michael to respond quickly to any of your needs. I submitted an equiry to Michael on his website - and within 20mins had a return phone call and appointment for the Saturday morning. On Friday evening he texted to confirm the appointment - and showed up promptly. He efficiently diagnosed the issue with my 'past use by date' cupboard hinges - went shopping, purchased and replaced the hardware. Very happy with Michael's work, efficiency - what a lovely guy ... I'm looking for extra jobs for you to do Michael!